To understand the connection between the development of Martian power systems and technology that can pull oil from old wells or capture gases released during drilling, it helps to think of atoms—particularly carbon, oxygen, and hydrogen atoms—like Tinkertoys. Different configurations have sometimes drastically different properties, particularly when an element is added or removed, and rearranging them is just a matter of using the right chemical reactions. 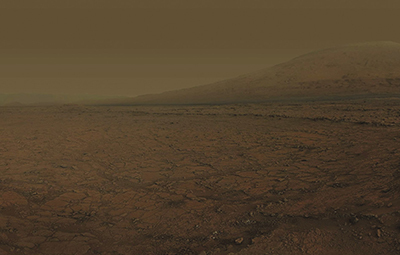 The Martian landscape, as imaged by Curiosity. Future spacecraft visitng Mars, including crewed missions, will likely use resources on the Red Planet to manufacture fuel for the trip home. Take this conversation with Robert Zubrin, founder and president of Pioneer Astronautics and Pioneer Energy, on the subject of making rocket propellant on Mars: “It can be done by combining hydrogen, perhaps from Earth, with Martian carbon dioxide—the atmosphere is 95 percent CO2—to produce methane and water. You can electrolyze the water and make oxygen, recycle the hydrogen off the electrolysis, and doing that will yield a lot of methane and oxygen, which is a good combination for rocket fuel. With that, you can return home to Earth,” he explains. “Later on, we did some work where we would be able to make methanol and oxygen on Mars, and then we did a system where we decomposed methanol and water into hydrogen and carbon dioxide to produce lifting gas for research balloons,” he continues, speaking as if it were as simple as making a little windmill from sticks and spools. Zubrin has what might be called a restless intellect. President of the Mars Society and a primary developer of an oft-referenced plan to put humans on Mars called Mars Direct, he has been championing colonization of the Red Planet—and working on the systems to make it happen—since the mid-1990s. Among the 10 books he’s published, though, are also a satirical science fiction novel lampooning the Israeli-Palestinian conflict and a five-act play portraying Benedict Arnold’s betrayal of the revolutionary army. He devised a three-player version of chess when he was 20 and patented it. And in 2010, Zubrin appeared in a viral Symphony of Science music video along with Carl Sagan and other famous science popularizers. In the course of its work, Pioneer Astronautics has won about 60 Small Business Innovation Research (SBIR) contracts, most of them with NASA. They have totaled more than $12.5 million, which Zubrin has used for projects as diverse as a Mars hopper vehicle that uses carbon dioxide from the atmosphere as the engine propellant, a magnetic sail that would propel a spacecraft by using a magnetic field to deflect plasma winds, and a precision-landing parachute system designed for Mars’ thin atmosphere. Some of the earliest contracts, dating to the mid- to late 1990s, were with Johnson Space Center and focused on creating rocket fuel on the surface of Mars through molecular mixing and matching. These followed work he had done as a NASA contractor with Lockheed Martin and Martin Marietta Astronautics Company, developing advanced space exploration strategies. “He started with Lockheed Martin and helped build one of the first prototypes for how to collect carbon dioxide from the Mars atmosphere and turn it into oxygen and methane,” says Gerald Sanders, In-Situ Resource Utilization (ISRU) chief engineer with the Propulsion and Power Division at Johnson Space Center. He adds that Zubrin then went on to experiment with other chemical processes with Pioneer Astronautics, such as ways to make oxygen from carbon dioxide using a reverse water-gas shift process with water electrolysis—using electricity to separate water’s hydrogen and oxygen atoms. “A lot of his work, like the name of his company, was very pioneering, trying different things out that may be interesting to NASA for exploration,” Sanders says. He notes that much of this experimentation applies not just to his line of work—finding ways to collect and put to use the molecules available on Mars or the moon— but also to life support and power systems, the backbone of any space exploration mission. Sanders’ group is still working out the logistics of tying all these systems together. Now that it’s known that there is water in the soil on Mars, he says, the best way forward appears to be processing that water to get hydrogen, which can be combined with carbon dioxide from the atmosphere to form methane for fuel, as well as oxygen, which is useful for both fuel and life support. All this would be powered by a small nuclear power plant and would require a soil processing plant and carrying rovers to excavate soil. The added equipment would total about 2,000 kilograms, which is significantly less than the 6,500 kilograms of methane that would be brought from Earth to get a rocket from Mars into space without processing soil. 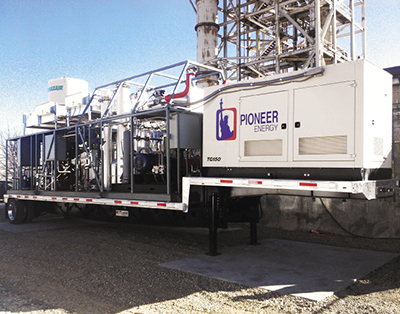 Pioneer Energy’s Mobile Alkane Gas Separator (MAGS) system separates flare gases that naturally occur at drilling sites into three streams: one can be captured in tanks and shipped off for sale, another powers generators that run the drilling operation, and a third powers MAGS itself. Pioneer sold its first MAGS unit in late 2014 to a company operating in North Dakota, where flare gases are most often simply burned onsite, the gases wasted. Zubrin’s work on this sort of molecular alchemy during his early work with NASA has more recently led him to two projects that are likely to have a dramatic effect on the oil industry back here on Earth. “Some of these SBIRs made me realize that we could take a form of this technology, run it backwards, and we would have something we could use on Earth for oil recovery,” Zubrin says. In 2008, he created Pioneer Energy to put the theory to work. On Mars, carbon dioxide would be combined with hydrogen to make methane and water, and the water would be electrolyzed to make oxygen and hydrogen. Depending on its geology, only about 30 percent of the oil in a well is captured by the initial pumping. In the early 1900s, a technique was developed to then flood the well with water, which the oil floats on, and this method yields another 20 percent of the original oil store. Still, half of the oil remains in the ground. The 1980s saw the advent of “enhanced oil recovery” (EOR), in which carbon dioxide is pumped into the well, where it mixes with the oil, making it less viscous and pressurizing it, which allows another 20 percent or so of the original amount to be removed. In the process, the carbon dioxide can be sequestered. The company started testing its first full-scale model of the PERT in spring of 2014. By then, though, the company was also testing the first field unit of another, related system. Currently, natural gases released during oil drilling operations are often simply burned off in gas flares. Pioneer Energy’s Mobile Alkane Gas Separator (MAGS) system would separate these gases into three streams, one to be captured in tanks and shipped off for sale, another to run a generator that would power the oil drilling rig, and one to power the MAGS system itself. While working on the carbon dioxide-producing system, Zubrin got another idea—a sort of spinoff of a spinoff. “Some of the subsystems involved in the research effort led us to an idea on how we could design a system that may seem unrelated but actually uses a lot of the same subsystems,” he says. 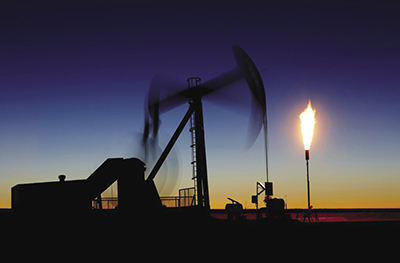 During the early stages of oil drilling, long before carbon dioxide is necessary, large amounts of natural gases may be released from the earth. In the industry, these are known as “flare gas” because, being byproducts released in isolated locations that lack plants and pipelines for processing them, they’re often simply burned onsite in what are called gas flares. This has become a contentious practice, particularly in North Dakota, where there is much more interest in extracting oil than in capturing gas, which has a significantly lower market value. Pioneer Energy’s Mobile Alkane Gas Separator (MAGS) system would separate these gases into three streams. One consists of propane, butane, and pentane, which can be captured in tanks and shipped off for sale. Methane can be used to run a generator that would replace the diesel generators powering the oil drilling rig. And ethane is used to power the MAGS system itself. “So that came out of the Pioneer Energy company work, which in turn came out of my NASA work,” Zubrin says. The first MAGS field unit was tested in the spring of 2014, and units were sent to North Dakota later that fall. The advantages of the MAGS system are manifold. “We greatly reduce the flaring and the need for diesel fuel, and we produce liquid propane and butane for sale,” Zubrin says, adding that the system is also self-sufficient. 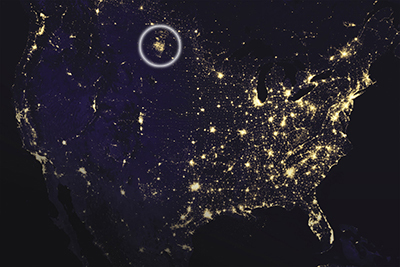 So much gas is being flared off at oil drilling sites over the subterranean Bakken formation in North Dakota that at night the oil fields can be seen from space, shining nearly as brightly as any metropolis. Meanwhile, the PERT system can generate enough hydrogen for 1.3 megawatts of electricity while producing about 500,000 cubic feet of carbon dioxide per day. This is enough to run a small EOR operation, Zubrin says. For a large well, it’s sufficient for the pilot operation that would justify a carbon dioxide pipeline. It just took a restless mind—one that could be said to be highly reactive to ideas and theories—to make those connections and turn those Red Planet concepts into blue planet realities.